There is bait around, and therefore lots of fish. On Saturday there were mackerel a’plenty off breaking rocks. They were super picky though, and we only got some by using sandeel chum with a single sandeel on a naked hook drifted down with the chum. Sabiki rigs, even directly inside the chum slick, just wouldn’t pick up the macks. Once we figured out the method it was easy to pick up 10-12″ fish on every cast. Not all of the 30+ boats jigging on the rocks were quite so lucky. Those mackerel were very handy on the outgoing tide in the mouth of the Merrimack. Lots of people drifting chunks and livelining macks were hooking up. Our friend Brian’s two-person boat braved the mass of weekenders drifting. Only 4 fish over 5 hours, but lots of missed takes on whole macks. Two fish in the boat were cookie-cutter 40″ bass. One saved for the table, one released. Some large bluefish were cutting the bait in two as well. The flats, which were stuffed with bass all last week, seemed to empty out over the weekend. One of the contributing factors could be the warmed up water. Temperatures went as high as 79 degrees on the surface. That’s way beyond striper’s usual feeding realm. The oceanfront picked up this weekend as well. Looks like the bluefish swooped in on Sunday, as there were multiple reports of surface feeds Sunday and Monday. Lot’s of angry looking 5 pound yelloweyes munching on juvenile herring. This is one of the most fun times if you’re into fighting the blues. Topwater plugs were working well. Anything that made noise. Also, the simple Charlie Graves tins were producing too. And of course trolling. Here’s a nice fish weighed in this weekend. Mike Sirois, Boat, Mackerel, Mouth of river, 8/15/09, 26lbs. 12ozs. 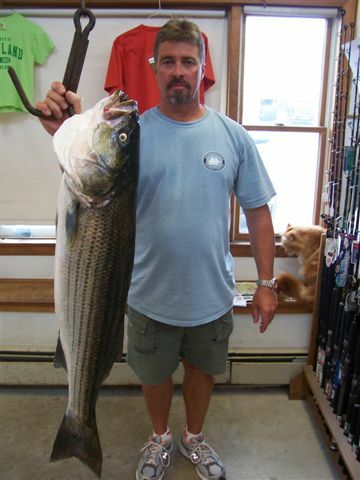 8/12/09, Dan Connolly, Boat , MR river-flats, Tube-n-worm, 2 fish, 17-12, 19-8 lbs. 8/12/09, Brendan Wallace (works at Surfland) and brother Shaun (both 16), caught 2 stripers out of their boat. 20-6, 18-8. One caught on tube-n-worm, the other a pencil popper. On Joppa Flats.